As we headed down US 67, the modern art scene and sometimes parallel universe of Marfa, Texas had been such an amazing trip, we could not have imagined what awaited us upon arrival at the small stone entry gate to the 30,000 acre piece of heaven in the high desert of the Texas Big Bend known as Cibilo Creek Ranch. According to the web site, Cibilo Creek Ranch (Cibilo Creek Ranch ) was founded by Milton Faber, a transplanted Missourian, in 1857. Built to withstand the attacks of hostile indians and others, the private fort is located in a breathtaking, mountainous landscape of austere and mesmerizing beauty. With plentiful water from springs nearby, Faber built a ranching and agricultural empire with over 20,000 longhorn cattle, goats and sheep. 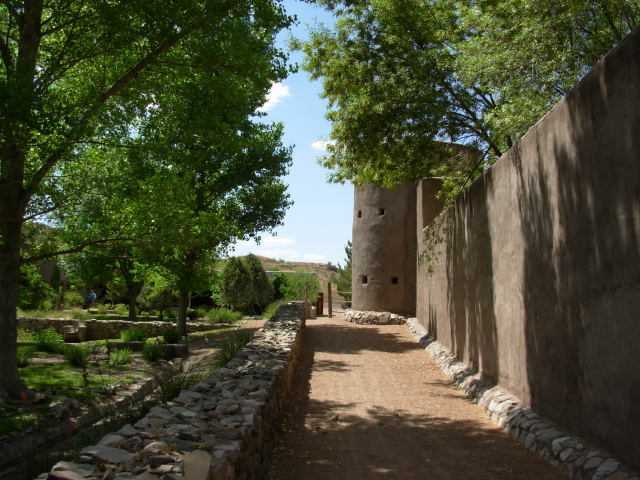 The website provides a fascinating and detailed history of Cibilo, which, to my knowledge, is the only "fort" in the United States that has been transformed into a boutique destination resort. With every conceivable comfort, this is no stripped down glam camp. From the stunning architecture to the down filled beds to the vine covered porches and Mexican tiled walkways, Cibilo is chock full of character and comfort. Take all of that, throw in the cleanest, coolest, driest desert air found anywhere, and you just don't ever want to leave this desert oasis. As we were ushered into the private concierge room and made arrangements for our stay, the architecture of this unique place was everywhere. As we were shown the dining and living rooms, as well as the wine storage area, I became more aware that no detail had been left to chance. Our room, which opened onto a long communal screen porch with a view of the small pond in the center of the compound and the mountains beyond, was everything you would expect in any five star hotel - great bed, large bath/shower area, classic furnishings and, best of all, no telephone and no tv!!! I have talked in other posts about the unplanned and unexpected pleasures of traveling. The story of the restoration and conversion of the Cibilo Fort and the reestablishment of the ecology of the area by visionary owner, John Poindexter, is well detailed on the web site. As an architect, I have always had a keen interest in the stories behind the creation of unique places. Who better to give a first hand account of the herculean task of transforming this amazing place than the man himself. As we prepared for dinner, which is served by gracious hosts around a large dining table in the main "house", we were told the owner would be dining with us. This is where one of those moments you never forget enters the story. Not only did we learn of the vision, challenges and work involved in creating this unique resort, what started out as a rather formal dining experience, with a very eclectic group of strangers, turned into a three hour dining experience full of stories and tall tales. After dinner, we relocated to a massive outdoor stone fireplace, under a full moon, for more wine and conversation. The perfect setting to end a wonderful day of life in this desert enclave of stone, rust and old wood with great people we had only just met. 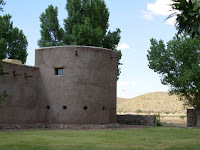 As we visited other parts of this vast ranch (there are two other collections of buildings) we began to understand what draws people to the desert. Frank Lloyd Wright once said that he always found inspiration when he visited the Grand Canyon, another natural architectural masterpiece in the desert. You understand that inspiration in a place like Cibilo. Every stone, every cotton wood tree, every ravine seems to have been "designed" to create the perfect landscape. In addition, Cibilo has a diverse assortment of animals, including buffalo, Texas longhorn cattle ,and even camels, which were were originally used by the cavalry in this part of Texas in the 1850's. Places like Cibilo Creek Ranch create there own culture. They take you into there world and change you. I have said it before, but it bares repeating. The Nomad Architect is not about nice sheets and great service. It is about places like Cibilo that you really never leave. 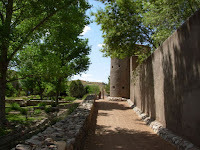 As we drove back to the airport in El Paso, I was so thankful that we had found this unusual place, designed to relax the head and nourish the heart, and I could have sworn I heard Texas Rangers August McCrae and Woodrow Call arguing over the best route to Montana. They say you can't get there from here. But when you finally get there, it is well worth the trip. A close friend, a Florida transplant who now lives in Austin, says Texas really is like living in a different country. After my last visit in the spring of 2006, I know what she means. Everyone knows about the cultural and music scene in Austin or the big city glitz of Dallas, but few have experienced the sometimes surreal experience of west Texas and the art enclave of Marfa, Texas. In addition, the boutique destination hotel/resort Cibilo Creek Ranch (Cibilo Creek Ranch) is a mere thirty minutes south in the high desert country of west Texas. After landing in El Paso, we knew we were in a "different" country when the car rental agent made me sign a document stating that I would not take the rental car into Mexico and then gave me a stern lecture on what would happen if I violated that agreement. We grabbed some lunch and headed down I-10 for the three hour drive to the small town of Marfa, Texas where we planned to stay for one night before our final destination at Cibilo Creek Ranch. Leaving I-10 behind for US 90, we headed further into the Texas desert. One of the great joys of travel, especially road trips, is the serendipitous occurrence of the unexpected. 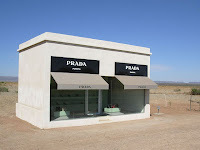 Imagine our delight when we came upon Prada Marfa (Prada Marfa Video) , a permanent architectural art installation designed to resemble a Prada store. Complete with high design shoes and handbags, this small building/sculpture, literally in the middle of nowhere, served as an iconic marker of more to come thirty miles down the road. The Hotel Paisano (Hotel Paisano), which housed the cast and crew of the classic 1956 film Giant, starring Rock Hudson, Elizabeth Taylor and James Dean, was the perfect place to rest up for our venture into the world of Marfa. 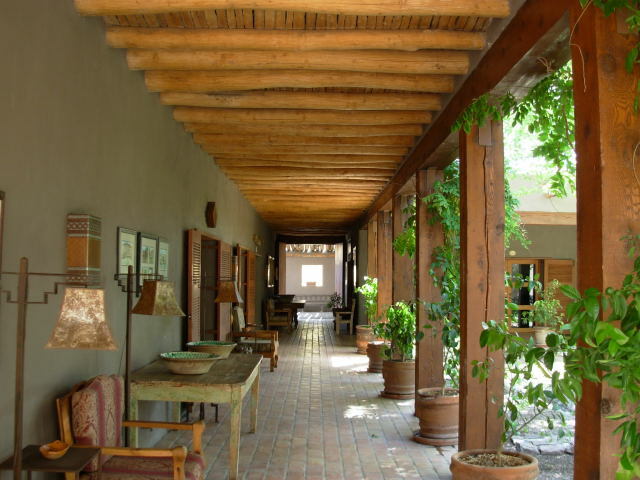 Opened in 1930, this restored Spanish Revival gem captures an earlier time of a Texas community that was the center of the cattle business and social life of west Texas. With exquisitely detailed interiors, a stunning courtyard, open air balconies and an indoor swimming pool, it is the perfect base to enjoy the many bounties of this cool little out of the way place. The other hotel worthy of note is the Thunderbird (Thunderbird Hotel Marfa). A minimalist renovation of a classic 50's motor hotel, it is another option for those that want to enjoy a different design approach for sleeping while in Marfa. New York has MOMA (MOMA), LA has The Getty (J. Paul Getty Museum) and Paris The Louvre (The Louvre). The Chinati Foundation (Chinati) is Marfa's answer to the question: What in the world is there to do in Marfa, Texas? 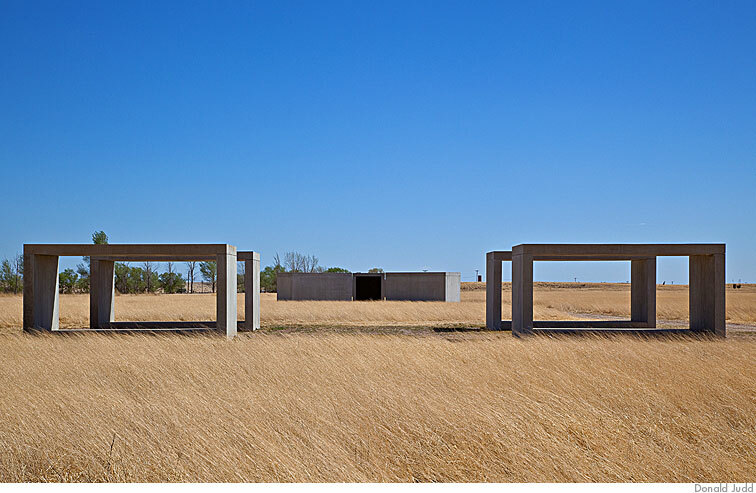 Established by visionary artist Donald Judd, the foundation officially opened to the public in 1986. Comprised of various buildings at locations in and around Marfa, the permanent and temporary collections are both provacative and powerful. Due to physical limitations, large works of art and sculpture are often compromised in museums. None of those limitations are in evidence here. Large outdoor sculpture, as well as works by Judd and other artists, are housed in converted artillery sheds, older utilitarian buildings, houses and smaller galleries downtown, allowing the viewer to see the work as the artist originally intended. So plan on spending the day in this utterly facinating world where cow town meets modern art in one of the most unique environments you will ever experience. Just like the art and architecture, Marfa offers unique eating choices. For dinner, we enjoyed oustanding Italian, with a Texas twist, at the intimate Maiya's (Maiya's). With stark, minimalist interiors of white walls, concrete bar tops and bright red light fixtures, it proved the perfect place for dining after a busy day of Marfa culture. After dinner, we drove out of town to view the Marfa Lights. These paranormal lights, visible from a viewing station on US 67 just outside of Marfa, have yet to be adequately explained. As we headed back to The Paisano, thinking about the days events - the Prada store/sculpture, the minimalist art in sheds and fields in this little corner of west Texas and, now, unexplained night lights - I started to see and hear Rod Serling everywhere!! After a very peaceful sleep in our room overlooking the pool, we started the day at The Brown Recluse, a unique cafe serving Fench Press coffee (They roast their own beans on site) and amazing omelettes. The perfect start for more gallery hopping and then on to Cibilo. Unfortuantely, this very hip little eatery has since closed. As we headed out of Marfa to our final destination at Cibilo, we knew we had found one of those places that makes you realize that taking the road less traveled - You will always be better for it. Check out this week's video artist Asleep At The Wheel. What better way to celebrate Texas than with the definitive western swing band in the tradition of Bob Wills and The Texas Playboys? One of the great things about traveling is discovering that things you thought you knew about a place turn out to be completely wrong. In 2008, my wife and I were looking for a getaway weekend within easy driving distance of Nashville, where we were living at the time. For some strange reason, Louisville showed up on the radar. Like most people, I always thought of Louisville as the home of the Kentucky Derby and The Louisville Slugger. While horse racing is great and making bats for America's pastime is a worthy pursuit, imagine my surprise when I stumbled on a website for a new boutique hotel in Louisville, claiming to provide a high design hotel combined with an art gallery. The 21c Museum Hotel (21c Museum Hotel), which had received rave reviews from various high profile travel critics, made the concept of a "museum hotel" too interesting to pass up. So, after reading as much information as possible on a heretofore unheard of boutique hotel (it opened in late 2006), we booked a room for two nights, packed the car and headed up I-65 for the three hour drive from "Music City" to "River City". One common quality of all great hotels is the arrival and check-in process. As we were ushered into the highly evolved and art filled lobby by the nattily dressed valet, I knew this place was different. The concierge staff, all dressed as if playing a part in a 1940's Bogie and Bacall film, quickly checked us in without delay. 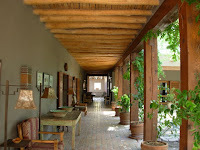 We were then whisked to our room, via art filled halls and ante rooms, by a modishly well dressed and friendly bellman. And to make the experience even more surreal, limited edition red penguin sculptures by Cracking Art (Cracking Art Group), were everywhere!! The great Bauhaus architect, Ludwig Mies van der Rohe said "God is the details". The designers of this hotel adhered to that timeless dictum in every facet of the design. Our Deluxe King City View room, in addition to the great artwork in evidence (they only exhibit works by living artists), was one of the most highly evolved hotel sleeping spaces I have ever encountered. The bed, the furniture, the fixtures - every facet of the interior design was conceived as an eclectic, unified artistic space. Given the propensity of interior designers to fall in love with a "look", this hotel asserts its sense of design with the ease of a Michael Buble' ballad. The bed was a "Please don't ever make me get out of this bed" bed and the shower was Bigelicious!!!!! I know a little something about art, but I am an expert when it comes to comfortable beds and great showers. After settling in and having a small glass of complimentary wine in our room, we headed to the hotel's Proof On Main restaurant. The obsession with detail and quality continued here with an incredible meal in an elegant, art filled space for dining. Like the hotel, the food, prepared with the best local, fresh ingredients, was an inventive blend of Italian and Southern tradition and cutting edge "design". Great service, a great room and great food should be enough to put a hotel on The Nomad Architect's Allstar List. But the 21c doesn't settle. This visionary boutique hotel turns a great weekend retreat into an art filled experience with The Proof gallery. With revolving exhibitions, containing a diverse mixture of mediums, combining big names and lesser know cutting edge artists, the work is worthy of any big city gallery. Funded and operated by the International Contemporary Art Foundation, this 9,000 square foot gallery is a great experience on its own, but, combined with 21c and Proof On Main, the total travel experience is what the Nomad Architect is always obsessively searching for. So what about Louisville? After enjoying the hotel, the gallery and the restaurant, we decided to see what the city of Louisville had to offer. Filled with impressive art galleries and studios, as well as the Ohio River through a vital, resurgent downtown, I had to take back everything I had ever thought about this vital urban center. One last thing makes the 21c a unique hotel experience. The Restrooms. That's right. The Restrooms!! Rather than describe it, you can see it on this very cool video (21c-Best Restroom Video), complete with soundtrack. So, if you ever attend the Kentucky Derby, or if you just want to have a great weekend away, I highly recommend staying at the 21c, a great little hotel away from the maddening crowd. PS Check out this week's Videos from the very cool, very country, very jazzy, very ironic Lyle Lovett. I have not really discussed our upcoming trip to The UK because I want the posts about the various places we plan to stay to be immediate and timely. However, after receiving an E-mail from the on-line concierge at Natural Retreats (Natural Retreats - Yorkshire Dales), a modern hotel retreat in the countryside of central England, with news about a visit from Aussie celebrity chef Bill Granger (Bill's Website) from Sidney, I just couldn't resist. Since food is such a critical part of traveling well, I would be derelict in my duty as a true Nomad Architect to ignore the serendipitous timing of a renown chef doing a tv show that also highlights the uniqueness and architectural quality of a place we will be staying. The Introductory Video (Bill Granger Chef at Natural Retreats) gives a brief glimpse of the kind of place Natural Retreats is. Great Britain is known for its traditional B&B's with old beds, old curtains, old furniture... well old everything. 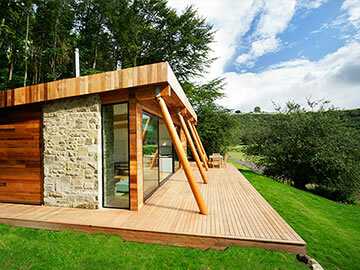 Natural Retreats is part of a new breed of hotels in the UK that is bringing fresh ideas and high design to travelers. With minimalist green designed cabins, set in the breathtaking countryside of central England, it has been on my radar since we started planning our UK trip. One other item to keep in mind when you are making travel plans. Customer Service. How quickly do they respond to your questions? Is there web site easy to use and informative? Is the staff knowledgeable about the hotel and its amenities? Natural Retreats happens to have an Online Concierge to answer questions and assist with reservations. Not only was she helpful, answering every question while confirming our reservation, she was also witty, engaging and professional in every sense of the word. In this world of impersonal customer service, it was refreshing to deal with someone that truly cared about me and mine as we planned our stay. The Thames , The Castles, Parliament, Snowdonia, The Lakes, Blenheim - It won't be long now!!!! On a trip to France and Provence, like all good tourists, we flew into De Gaulle, one of the largest, most bizarre airports on the planet. Tired from the nine hour flight from the worst airport on earth, JFK, we were in need of some serious R&R. The Hotel Mayet in Paris (http://www.mayet.com/indexEn.html) provided one of the truly great hotel experiences in one of the greatest cities on earth. Webster's dictionary defines Lilliputian as a very small person or thing. Various descriptions, by reviewers, of The Hotel Mayet as " a hidden little gem" or "a well located compact hotel" do not begin to capture the essence of this little art filled hotel within easy walking distance of the Eiffel Tower. And the price was downright cheap for Paris! So what makes this little hotel a favorite in the Nomad Architect's pantheon of great places? Like any architect, I place great value on the "design" of a place. The Hotel Mayet exceeds all expectations in this regard. From the massive graffiti wall in the lobby to the several hundred year old arched stone breakfast space with the striped linoleum floors in the basement, this place oozes character and style, without being pretentious. The attention to detail in such a big/little hotel warms the cockles of my architect's heart every time I conjure up images of this place unknown by most. Every door handle, every fixture, every painted wall has been designed with a unique combination of elegance and passion. The ride up the world's smallest hotel elevator alerted me to the fact that we were in a very cool place. We laughed all the way to our floor as the two of us squeezed in with our luggage. Like the rest of the place, no detail is left to chance. With brushed stainless steel walls and low ambient lighting, it's the kind of design detail that makes the experience of just riding an elevator something to remember. As we opened the door to our room, which had a large operable window opening onto the life and vigour of Paris, I realized that this hotel also had a sense of humor. Right there on the ceiling was a small eighteen inch rubber "inflated" fan that had the look of something from a graphic novel or comic book. The rest of the room, the bed, the shower, the walls - absolutely every square inch - combined efficiency, design and comfort that made sleeping in this little "cocoon" the best place we could be for that much needed R&R. After a simple, wonderful dinner next door at a small bistro/restaurant, recommended by the gracious Parisian concierge, we decided to take a stroll in the Paris night air. As we turned a corner, there it was - The Eiffel Tower, Gustave Eiffel's masterpiece of industrial age design, shining like a great beacon in this romantic city. As I held my wife's hand, I realized what life can be with the one you love. As we returned late to our little world of comfort and elegance at our newly found Mayet, we wandered off into nod secure in the knowledge that this was indeed something special. Winston Churchill, Oscar Wilde or George Bernard Shaw said, depending on which source you choose to reference, "Britain and America are divided by a common language". That statement has become more relevant as we are preparing for our tour of the British Empire. The title of this post is the name of a small town in Wales which means "Church of St. Mary in the hollow of the white hazel trees, near a fierce whirlpool and the Church of St. Tysillio, near the red cave". Any country that has a town named that, that means that, has to have a culture and a people worth visiting and getting to know. Of course, Wales is fiercely protective of its language and its culture. I say mympwyol, i.e. fantastic!!! So why is this important and why do we care and what does any of this have to do with finding a great hotel? A great place to stay, as defined throughout this blog, cannot be separated from the people and culture it is located in. If it is, you end up with just another expensive "hotel property". A friend once opined that you could be dropped from the air at the interchange of any interstate in America and you would have no idea where you are. That is sad, when you think of the diversity of America. One can only hope this doesn't happen in Europe and other parts of the world. You have to take the road less traveled to find those places that haven't been homogenized by the travel industry. Places that add to your street cred as a true nomad. Yeah, yippee, hallelujah!!! We finally found an amazing Hotel/Pub in the Snowdonia National Park in Wales. This was the last piece of our hotel puzzle for our tour of the UK. I will let you know how it goes during the trip. Traveling is supposed to be fun right? Well, finding a great hotel is serious business. Case in point. If you google "Boutique Hotels in Venice", Trip Advisor will show 447 hotels ranked #1 to # 447. How in the world are you going to wade through all of the reviews, photographs and other critical data necessary to make a decision. How do you find places that are unique, with the qualities espoused by this blog? There are multiple answers to that question. 1) Know Thyself. One guy, usually an architect, waxes about the poetry of the minimalist space and the Barcelona chairs. Another sees a big white room with grey trim and uncomfortable seating. So, it's important that you know what's important. For some, the "design" is the thing. For others, it's the 4,000 psi shower. 2) Variety Is The Spice of Life. Look for places that challenge your perception of what you find interesting. One of the attributes of hotel design in Europe is the willingness to combine different design motifs from different eras. American hotel designers rarely exhibit the willingness to create spaces that merge design "styles" like the Europeans. The Lumani Hotel/B&B in Avignon, France http://www.avignon-lumani.com/, designed and owned by Jean, an architect and Elisabeth, an artist, manages to insert highly detailed, minimalist designed rooms with an eclectic array of furnishings, into an eighteenth century manor house, which surrounds a large courtyard, complete with ancient stone work and modern scupture. It's a special place, just inside the walls of the old city. 3) Educate yourself. How can you expect to find a great hotel, if you don;t know what a great hotel is? I have always maintained that curious people make the best travelers. The same curiosity that will lead you to places like the little alcove at Big Sur that other people don't know about, will lead you to unknown hotel gems in out of the way places only found on the road atlas. Traveling takes study. Finding a great hotel is the equivalent of post graduate education. It must be focused and obsessive. 4) Reading Is Fundamental. The more you read about the history and culture of a place, the better equipped you will be to make decisions about where to stay. I am not just talking about the usual travel books. I am talking about books about a place that shed new light on your understanding and perception of a country or region. Reading A Year In Provence by Peter Mayle http://www.amazon.com/Year-Provence-Peter-Mayle/dp/0679731148 gave us such insight into traveling and living temporarily in that incredible region of France. It gave me a much better understanding of the culture and the people. They are amazing, by the way. 5) Become an Internet Junkie. That's right. Unless you have unlimited funds to buy every travel book and magazine on the market, you must become immersed in the Internet. I keep a highly detailed directory in my favorites, arranged by country, regions and towns, as well as hotels, restaurants, etc.. You know what works best for you. Keep it organized and delete items that you don't use or need. Sign up for E-mail alerts from travel sites, especially premier hotel sites. It's a great way to stay abreast of new places and deals that you won't find otherwise. I have already mention various links and web sites that are listed under Very Cool Places To Sleep & Eat. I will add others in the future. 6) Don't Settle!!! By being obsessive about finding the perfect place, you will find those places that bring meaning and real pleasure to your travels. I have spent untold hours per day for the last six weeks searching for those places in the United Kingdom that we will talk about for years. A great hotel is like a great woman. Beautifully designed, graceful and mysterious. Well, back to the grind. I am still searching for that perfect place in Wales for our upcoming trip to the UK. That's right - The current trading value of dollars to pounds is $1.62659. That is a very lonely number when you are planning a trip to the UK. However, we have continued undaunted in our plans to tour the British Empire with our daughter who is currently studying for her Masters degree at Goldsmiths University in London. Why do I bring this up? It is certainly not news that the dollar has gone in the tank against virtually every currency, particularly the euro and the pound. The impact of this means that it becomes more challenging to find places of quality when you are on a budget. There are several do's and don'ts when trying to find hotels, B&B's and other places to sleep when money IS an object. Don't waste your time using "bundle" travel sites like Kayak, Priceline etc.. I have NEVER found any price for a hotel to be less than the price offered by a premium site such as I-Escape or a given hotel's site. Don't reserve hotels that require payments when the reservation is made, unless you know that you know it's a great hotel and a great price. Don't trust in travel books for places to stay. They tend to be limited and are not usually the kinds of places that necessarily have character and architectural quality. Do use sites such as I-Escape (http://www.i-escape.com/), Epoque (http://www.epoquehotels.com/) or Tablet ( http://www.tablethotels.com/ ) are all well designed with great filters for price and location. One caveat - Usually the "from" price is less than what the reservation price will eventually be. I always go to the actual hotel sites to confirm prices and availability, if I can. Do plan to spend hours on the internet looking and finding great places. You have to become an architectural researcher to find places that meet the criteria of commodity, firmness and delight so profoundly stated by Vitruvius. Do use every review site you can find to confirm your selections. I find Tripadvisor to be excellent because it includes virtually every hotel and B&B you google. Do look for places that are off the beaten path. Usually the best places are away from the maddening crowd. One last thing I highly recommend using when planning travel anywhere in the world - The Hip Hotels Book Series (http://www.hiphotels.com/index.php). I have found some amazing places to stay from this series of books. Plus, they are beautifully photographed and make great coffee table books. Stop the World, I do NOT want to get off. Well I guess this is the official "launch" of this blog THE NOMAD ARCHITECT. I am not exactly a techno-geek, so I am sure I have made many technical mistakes putting this thing out there. But, I am boldy going where I have never gone before - the blogosphere. The real idea behind this blog is actually twofold: 1) We have done a fair amount of traveling and will be sharing our experiences past, present and future and 2) Here's what makes this blog different - Some people think that where they stay when they travel isn't important, as long as it's clean, has a good bed and good water pressure. Well, if you subscribe to that philosophy, then this blog is probably not for you. I believe that where you stay, the uniqueness of a place and the quality of the environment can actually change your mindset, even your reality of a country, its people and its culture. And I am not just talking about 300 count Egyptian cotton bedsheets! I am talking about places that have a unique architectural and even artistic quality that make traveling transcend the idea of a vacation. 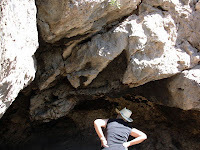 Please sign up for E-Mail Updates and feel free to comment and offer suggestions for the blog or places you have found in your travels. Also, check out the Links we already have posted for various places and travel info.. Finally, I have included a Video of The Week with either a favorite artist that I never go anywhere without or a video relevant to this blog.